Rwanda has conducted its third aerodrome emergency exercise drill to perfect quick rescue preparedness in case of airplane crash. The simulation exercise was held on Monday – January 11, 2019 at Kigali International Airport. It includes putting out fire of the burning airplane, evacuating passengers in crushed plane and giving first aid to patients. 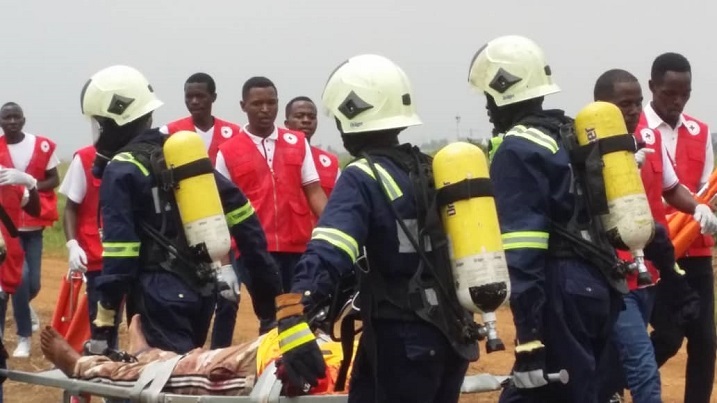 Other exercises include emergency transport of patients from the accident spot to the nearby hospitals and carrying out an investigation on the cause of the airplane crush. The simulation exercise is a requirement by both Rwanda Civil Aviation Regulations and International Civil Aviation Organization (ICAO) standards. At the start of the exercise, a fictional scenario of a passenger plane crash is organized whereby trained actors impersonate injured people in fatal accident who are in need of emergency response. Airport officials are placed in a strategic area to monitor and evaluate the exercise and to ensure effectiveness. Towards the conclusion of rescue efforts, an investigative team is allowed on the ground to track the cause of the accident, meeting relatives of the victims and counseling them. “The exercise is conducted with an effort to simulate a real crisis. It is important that the people working in the airport company and other stakeholders have the skills to respond to real accidents effectively, though we don’t wish to have accidents,”Isabelle Umugwaneza Managing Director of Rwanda Airports Company told KT Press. “This exercise is conducted every two years to help rescuers avoid panic in case of real accidents,” Umugwaneza told KT Press.